All photos courtesy Andrew Newey. They are are republished here with permission. You can find him on Facebook. "For hundreds of years, the skills required to perform this dangerous task have been passed down through the generations" writes Newey, "but now both the bees and traditional honey hunters are in short supply." 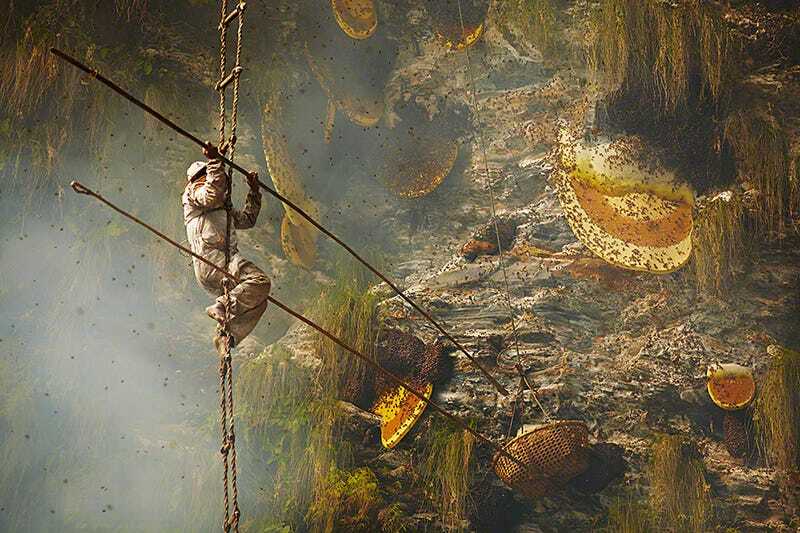 To collect the honey, the hunters use nothing more than handmade rope ladders and long sticks called tangos. Smoke is used to drive thousands of angry Apis laboriosa — the largest honey bee in the world. The majority of the massive hives are located on steep, south-west facing cliffs to avoid predators and for increases exposure to direct sunlight. The autumn honey hunt requires three days and is preceded by a ceremony meant to placate the cliff gods. The honey is lowered to a team of helpers waiting below.